Journal of Revenue and Pricing Management (RPM) provides an international forum for a wide range of practical, theoretical and applied research in the fields of revenue management (RM) and pricing. Each article emphasizes meaningful answers to problems, whether cutting edge science or real solutions. The journal places an emphasis on disseminating the best articles from the best minds and benchmarked businesses within the field of Revenue Management and Pricing. Revenue management, also known as Yield Management (YM), marries the diverse disciplines of operations research/management science, analytics, economics, human resource management, software development, marketing, economics, e-commerce, consumer behaviour and consulting. The journal is committed to publishing a multi-disciplinary set of views on key and emerging issues in in the field, and to encouraging greater understanding and linkage between the fields of study related to revenue management and pricing. 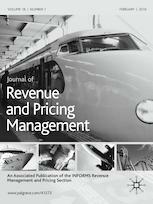 Journal of Revenue and Pricing Management publishes practice papers, applied research papers, case studies, models and theories, assessments of the key issues, new trends and future ideas by leading experts and practitioners, and book/conference reviews. It is essential reading for senior professionals in private and public sector organisations and academic observers in universities and business schools. When Revenue Management Algorithms go wrong!